Ready to add website engagement to your bag of digital marketing tricks? 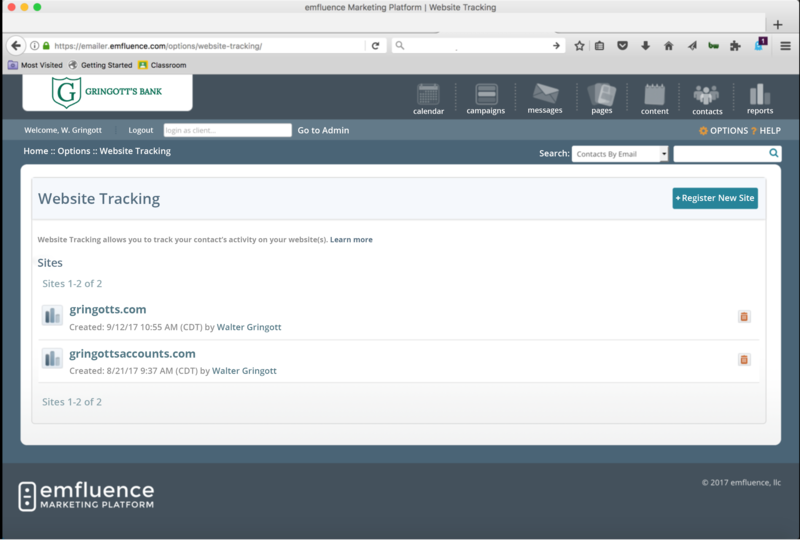 Then we have big news for you—Website Tracking is now live on the emfluence Marketing Platform! 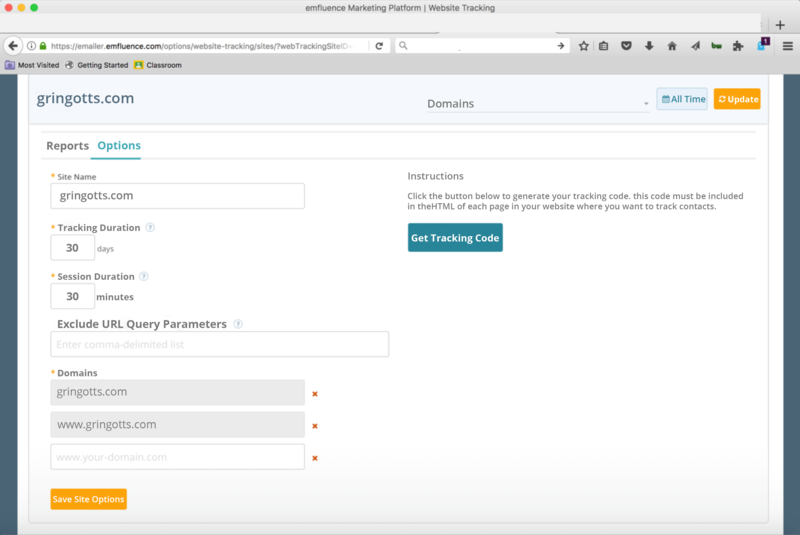 The new Website Tracking feature allows you to track Contact traffic on your website or websites (yes, you can add more than one). 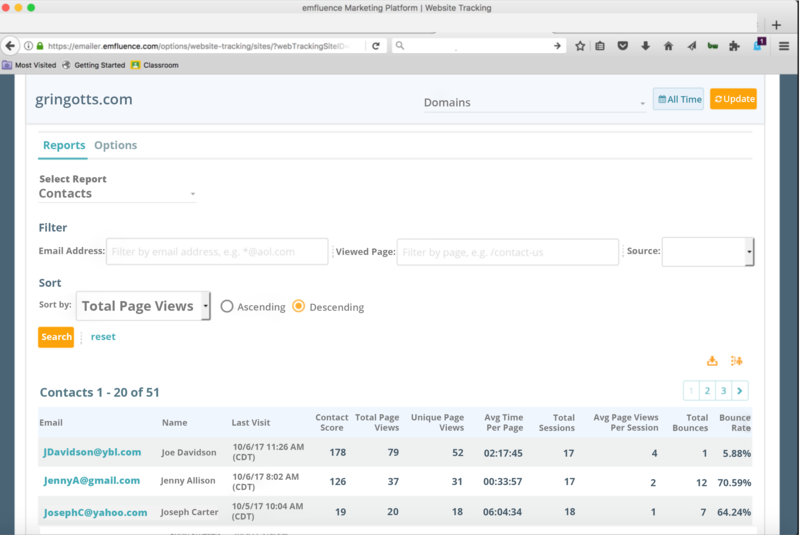 Once your site (or sites) is registered, the emfluence Marketing Platform pulls back actionable data on how your Contacts are engaging with your website. 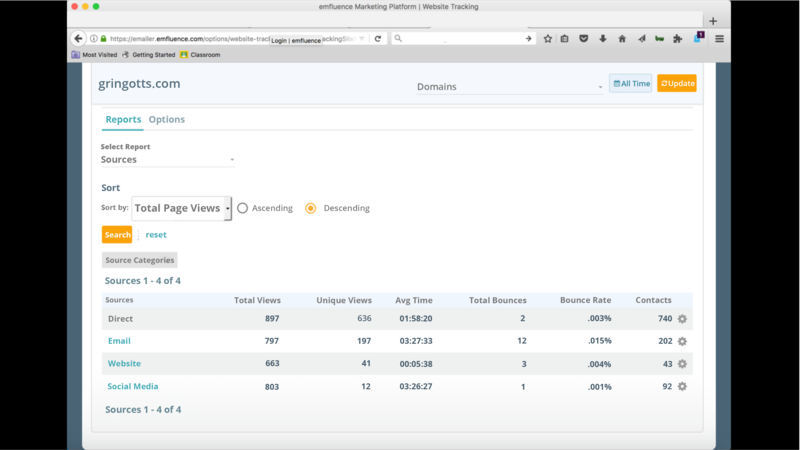 You’ll be able to see how your Contacts got to your site, and once there, how they interacted with it. You can also set a tracking duration (amount of time between visits before the contact will stop being tracked) or session duration (amount of time between visits before a new session is created) to customize the data based on your company’s objectives. If you have URLs you don’t want to track or have Contact Scores added to based on visits to a specific page (say, your careers page), you can add those in on this view as well. 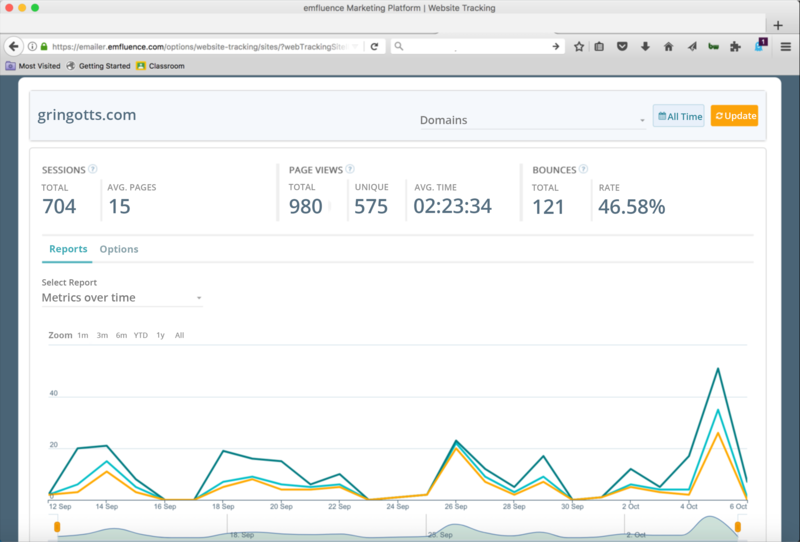 If you take a look at each source, you’ll see Total Views, Unique Views, Average Time on site, Total Bounces, Bounce Rate and number of Contacts driven to your site from that source. This data is actionable, too—click on the cog next to Contacts, and you can view the actual Contacts, download those contacts or Add/Remove Contacts from Group(s). The Pages report drills into the page views of your website—here you can see which pages were viewed, how many times they were viewed (total and unique), the average time on page, page-level bounce information, and which of your Contacts have viewed that specific page. By clicking on the cog next to Contacts, you can add these Contacts to groups (or remove them) for remarketing purposes. The Contacts report digs into individual information—email address, name, last visit, Contact Score, total page views, unique page views, average time per page for that Contact, total sessions, average pages per session, total bounces (over time), plus that Contact’s bounce rate. Here again, you can add these Contacts to Groups, or download them into a file for remarketing. We’ve focused website tracking around gathering actionable data from Contacts who have already engaged with an element of the emfluence Marketing Platform (email, survey, landing page, form). 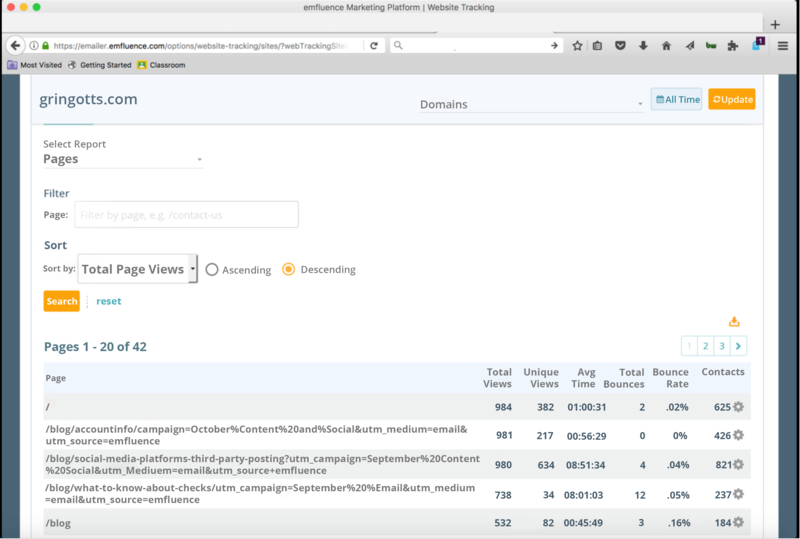 That enables you to create campaigns based on website engagement right out of the reporting view! Need help with set up or have additional questions? 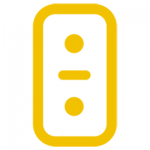 Contact us at support@emfluence.com.